For this week's Thrifty Thursday link up, I am showing off my latest Etsy purchases from the shop, Bohemian Bisoux Vintage. Owner, Lauren, is one of my newest sponsors & I am truly in love with her shop. I couldn't be happier with the items that I bought from her which are the 1960s vanity canister & 1950s tulle wrist corsage. I have to admit that I am a little bit more excited about the corsage just because I am thinking of all the outfits I can wear it with, either as a corsage on my wrist or pinned to my dress. Please everyone, go check out her shop, she has so many beautiful vintage dresses in a variety of sizes (XS to plus size), shoes, purses & other little "trinkets." And, what about the cute stationary that she uses?? Love! Thanks Lauren! Until next time! Oh yes, and that chair pictured above, I thrifted for $7! And then painted baby blue! Steal! Please link up with your recent or favorite thrifty purchases!! Also, be sure to follow your hosts & co-hosts (me) on GFC or bloglovin'! It's that time again! Let's see what goodies you found!! As some of you have noticed, I did a re-shoot. It was very much needed. I hate when I rush through things. I hope that you guys agree that these pictures are much better. Anyways, you probably also noticed that the back of my strap broke! Ah, sad face. I've worn them twice? So, they will be going back to Nordstroms. Anyways, I also wanted to officially announce on my blog that I will be a contributing blogger for Vancouver Fashion Week! Starting on September 18th I will be posting pictures & content about VFW! You guys will see pictures of beautiful clothing & I am so honored that they asked me to help them out!! You can read more about the show here. So get pumped! I know that I am! Until next time. 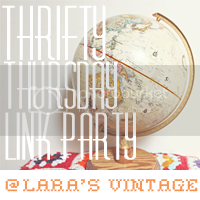 I am co-hosting another round of the "Thrifty Thursday" link up party! Created & hosted by Sandra over at Lara's Vintage. The rules are simple: link up one of your most recent thrifty posts, follow the host & co-hosts on GFC or Bloglovin' (follow me on Bloglovin'), share the TT button somewhere on your blog & if you could tweet about the link up and/or talk about it on Facebook (or just about anywhere so others can know about the blog hop). Thanks guys, until next time.